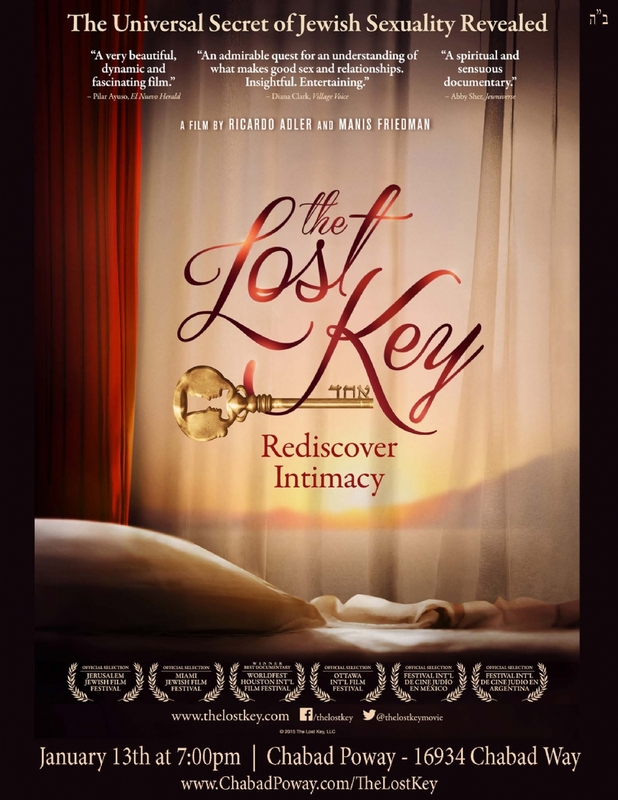 On January 13th at 7:00pm Chabad of Poway will be hosting a National Jewish Premiere , screening the award-winning documentary, "The Lost Key"
The Lost Key explores how a sexual relationship can go beyond mere physical pleasure and become a spiritual experience where two become One. This ancient Kabbalistic secret was kept hidden for centuries, but now filmmaker Ricardo Adler and leading Rabbis of this generation are breaking a historical tradition and revealing it for the first time. After a traumatic divorce, Ricardo set out to discover how to attain a fulfilling and lasting marriage. His search took him to renowned Torah scholar and marriage counselor Rabbi Manis Friedman, whose book Doesn´t Anyone Blush Anymore? boasts a cover quote by the legendary Bob Dylan. The film portrays the dramatic transformation of Ricardo's new marriage, and the reactions of other couples to this revolutionary way to intimate connection. The Lost Key reveals forgotten wisdom that could inspire modern society to rediscover intimacy and usher in a new era in sexual relations.